Easily manage and find all your miscellaneous information in one place. A fast and secure place to store the Metadata of your life. Click the tabs along the top of the screen to see how it can help you. Everything has a place! 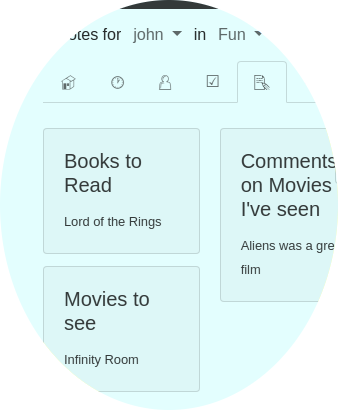 All the random miscellaneous data you have stored in various places and on post it notes can easily be added to LifePIM. From there, you can browse your data, or find anything quickly from the Search bar. Your connection is encrypted with SSL and all data is managed by Amazon Web Services, so your information is kept private and secure. We do not do any form of advertising or data mining - LifePIM stays profitable by selling Professional plans for businesses and advanced power users who need large storage spaces or more automated features. Folders are a powerful tool to make organisation of your information more structured - anything can have a folder assigned to it, and you can call these anything you like. 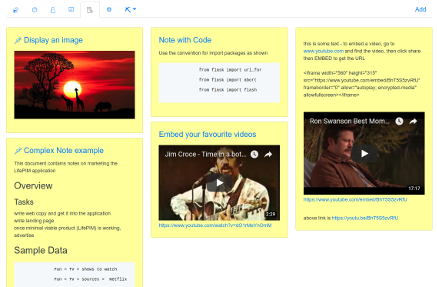 Over the years, you will have lots of notes, and the default view shows all notes, like the example. 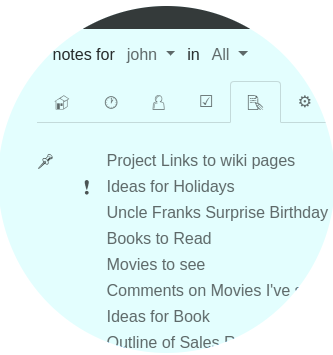 When you want to focus on something (like finishing a Work project, or planning a holiday), you can filter LifePIM on that folder so you only see those notes and tasks. Fast search finds everything in a flash! Do you like tagging things by typing TODO or IDEA? When you register an account you have a couple of example records just so you can see how it works, and from there you can start using it, but to speed things up you can import your existing information quickly. You can quickly add your information by entering special commands into the search box.